Bernie Ecclestone says female drivers would "not be taken seriously" in Formula 1 and believes they are "not physically" able to drive a car fast. The F1 boss made his controversial comments at an advertising conference. He added that Russian president Vladimir Putin "should be running Europe" and expressed support for US presidential candidate Donald Trump. The 85-year-old Englishman also claimed immigrants have not made a contribution to the United Kingdom. Britain's triple Formula 1 world champion Lewis Hamilton is the grandson of immigrants to Britain from the Caribbean island of Grenada. 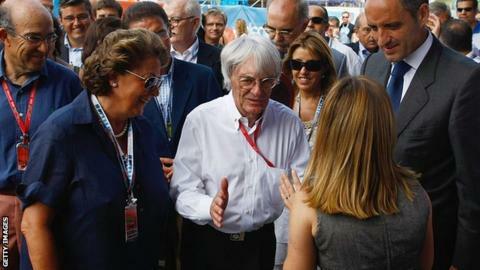 It is not the first time Ecclestone has caused controversy. In 2009, he praised Adolf Hitler as a man "who was able to get things done". Ecclestone was speaking to businessman and F1 non-executive director Sir Martin Sorrell at an Advertising Week Europe conference. His remarks about female drivers sparked plenty of reaction. British driver Pippa Mann, who has competed four times in the Indianapolis 500 and is a race winner in the US Indy Lights series, tweeted: "Sigh. #HereWeGoAgain." She added: "Perhaps someone should remind him that IndyCar doesn't have power steering, and we're strong enough to drive those." Susie Wolff was the most recent woman to pursue a racing career in F1. The Scot started working with Williams in 2012, after racing for seven years in the German Touring Car Championship. In 2012, she said one of the main issues behind a lack of females in the sport was young girls "have no-one to aspire to growing up". But the 33-year-old dismissed claims women lack the strength to cope with the demands of the sport. "We have 30% less muscle, so we have to work hard, but there's no reason why females can't get strong enough to race an F1 car," she said. Wolff eventually retired in November and set up Dare to be Different, an initiative aimed at increasing the number of women in motorsport. Ecclestone added that he thought an increasing number of women will take F1 chief executive positions in the future because they "are more competent" and "don't have massive egos". Claire Williams is currently the deputy team principal of Williams, having joined as a family representative on the board in 2012.